The Reform Party Thanks Its Own Secretary-General For Being Its Biggest Fan On Twitter – Sinking It In! 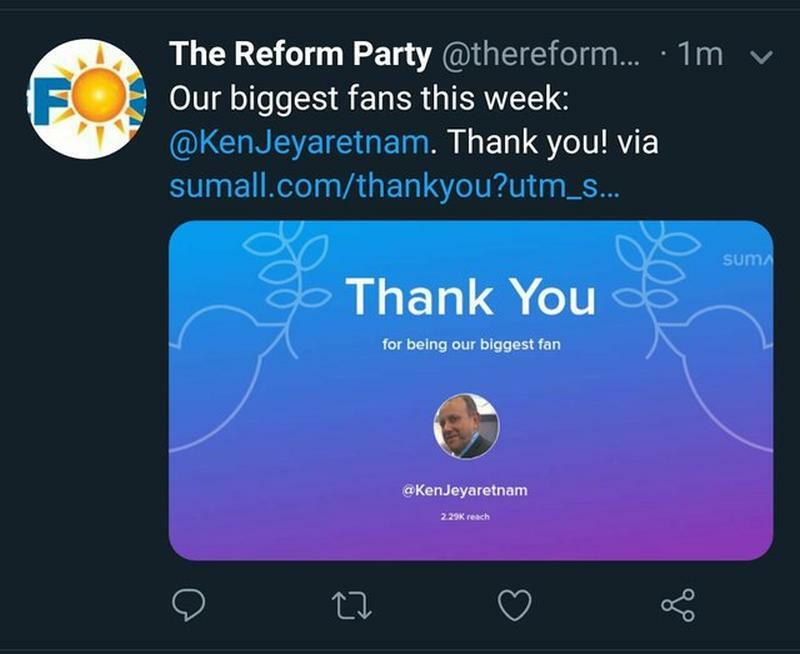 The Reform Party was hit by an amusing gaffe when it’s official Twitter page (@thereformparty) listed and thanked its leader’s personal twitter profile as its biggest fan. People were quick to notice this irony and said it was a perfect example of ownself fan ownself. The Reform Party’s leader is Kenneth Jeyaretnam and it should be no surprise that he is active on twitter. This thank you message is likely to be an automated tool used by The Reform Party to acknowledge their die-hard supporters. Although this is likely to be an honest mistake, it is thoroughly amusing and could also mean The Reform Party doesn’t really have a strong following since all the interaction online is dominated by their own Secretary-General.